Nancy Raven welcomes you to Lizard’s Rock Music! Welcome to the Nancy Raven and Lizard’s Rock homepage! Thank you for stopping by. Feel free to browse around, and enjoy your visit! Nancy Raven began singing childrens’ music to her own children more than 40 years ago when, as a working co-op nursery mother, she learned the value of music. 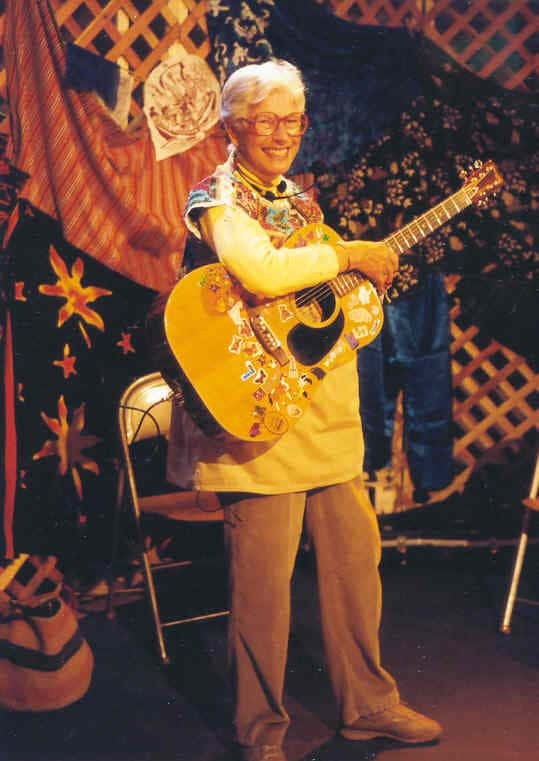 Nancy went on to make music an important part of the co-op nursery program, which she then directed for five years. Now living in Minden, Nancy has performed in numerous elementary school assemblies, library programs, summer camps, and special concerts throughout the West. She has appeared on KQED and KPFA radio stations, worked as an artist in residence for three years through the California Arts Council, and produced Saturday morning programs for children at La Peña Cultural Center in Berkeley for six years. Nancy won a 2003 Western Access Video Excellence (W.A.V.E.) award for “excellence in community media production and operations within the Western States Region of the Alliance for Community Media” for her childrens’ program “Lizard Soup” on Access Monterey Public Television (AMP). The program is shown four times weekly in the Monterey peninsula area. Nancy is also the subject of this article by famous author Daniel Dixon (son of painter Maynard Dixon and photographer Dorothea Lange). Here’s another little blurb about Nancy by Chuck Thurman, and here’s the lead-up to an interview with Nancy by Susan Cantrell. Nancy Raven Sings Her Favorites — Now available on-line!